Five F-Series Super Duty customers will witness all-new F-Series Super Duty development, testing and capabilities before anyone else and share their stories through We Own Work video series. Five Ford Super Duty customers, chosen at random, will participate in the durability testing of the next-generation 2017 Super Duty F-Series pickup truck. First shown at the 2015 State Fair of Texas, the new Ford heavy-duty pickups will have aluminum bodies (exactly like little brother F-150); heavier-duty axles, brakes and driveline components; and they will get better fuel economy. Ford will take these customers to the factory, the proving grounds and on the road to see exactly how these trucks are pushed, punished and put through their paces. Each of the participants — professionals from business sectors that rely on HD pickups — will have a chance to question engineers and designers as the pickups work their way through each stage of testing and fine-tuning. 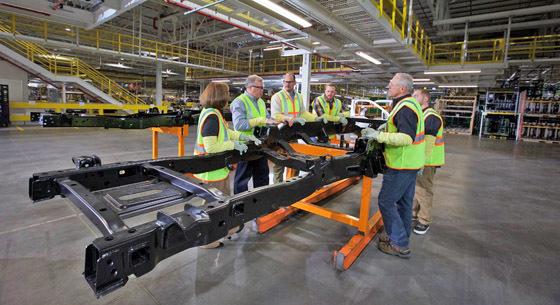 Ford is making a video series that follows these construction, forestry, oil, sanitation, private business and manufacturing professionals as they observe the new Super Duty work its way to its debut in late summer or early fall. The first of the "We Own Work" videos will come out in February, and will introduce the five participants and describe their businesses. Later episodes will focus on the new technology and features in the new Super Duty.